Some have claimed that the blood moon expected tonight could be a sign of the start of the tribulation or the return of Jesus or something else. But that type of blood moon was not a sign that Jesus gave in Matthew 24 related to end time prophecy. And I have repeatedly denounced that here (for more on blood moons, check out Blood Moons and Prophecy). 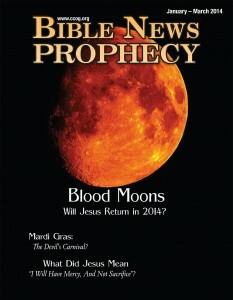 Basically, the blood moon teaching is based on the CLAIM that since there were four NASA-expected blood moons in or near the Spring and Fall Holy Days of 2014 and 2015, that this MUST be a message from God and that they likely would either start the ‘Day of the Lord’ or point to the return of Jesus Christ. And while tonight marks the beginning of the biblical Feast of Tabernacles, having a naturally-occurring ‘blood moon’ is not of prophetic significance. On a related note, one Messianic Jew (Jonathan Cahn, who also pushed the ‘blood moon’ nonsense) taught that global financial collapse might occur at the end of a so-called Shemitah year two weeks ago, while another (Mark Biltz) indicated that the tribulation could have started then (see Does end of Mark Biltz’s Shemitah mean that the Tribulation starts tomorrow?). But they were wrong (see also Jonathan Cahn defends ‘The Mystery of the Shemitah,’ whereas COGwriter denounces it and Dow Jones up in the ‘wake of the Shemitah’?). So, there was a claim that Jesus could return in 2015 based upon the red moon calculations that Mark Biltz researched. But that is a false claim. And I denounced it back then. Jesus will not return tomorrow. Mark Biltz is wrong. John Hagee, founder and current leader of the Cornerstone Church in San Antonio, Texas, has been prophesying for months that the upcoming “blood moon,” so named for the reddish hue that the moon takes on as it is illuminated by sunlight passing through the Earth’s atmosphere, will bring calamity. The Bible does not support that the occurrence of these blood moons are teaching that Jesus will return or the Day of the Lord start in 2015. While ‘something’ will happen in the Middle East in the next day or so, indicating that the blood moon phenomena points to ‘dramatic events in the Middle East’ or to Jesus’ return is not biblically supportable. Because of many false prophets and false predictions, many discount prophecy. Should you pay attention to prophecy? Some consider that most prophecy is already fulfilled, which is a wrong and dangerous position to take (see The Dangerous Rise of Preterists). I received an email newsletter about a year ago from a claimed Church of God (COG) group, which I will not identify, that basically claims because it reached 170 nations/territories over the internet that Matthew 24:14 has been fulfilled, its proclamation work is over, and the end was basically here in September of 2014. Of course, there are more nations/territories than that, and that group did not fulfill Matthew 24:14 (to put this in more perspective, COGwriter.com, for example, reached at least 221 nations/territories and with many times the number of visitors than that group did, and I still do not believe that Matthew 24:14 has been fulfilled yet–there is at least 3 1/2 more years, and at this stage, probably at least 4 1/2). So that particular group, like certain others that misunderstand when the end is, is wrong. Actually, nearly all the COG groups have significant prophetic misunderstandings. The Sardis group CG7-Denver, for example, is preterist and thus believes many events that are prophesied for the future are already past, hence Jesus warned them “you will not know what hour I will come upon you” (Revelation 3:3). Nearly all the rest of the COG groups are Laodicean and hold to prophetic misunderstandings, that unless they repent as Jesus tells them to (Revelation 3:14-22), they will not possibly know when the Great Tribulation will be (details are in the article The Laodicean Church Era, as well as a the new video 17 Laodicean Errors in Prophecy). Since many are wrong, is paying attention to prophecy and and current events important? In the first recorded sermon, the Apostle Peter tied current events in with biblical prophecy (Acts 2:14-40). Partially because people were aware of the events that Peter discussed, many paid attention and thousands were converted (Acts 2:41). Throughout the New Testament, Christian leaders did try to tie events to prophecy and other parts of the Bible to known events better reach their audiences (e.g. Acts 17:22-31). The first message that it is recorded that Jesus preached (the gospel of the kingdom in Mark 1:14) and the last message Jesus gave (the Book of Revelation) were prophetic. Various messages that He gave (e.g. Matthew 24, Luke 21) were tied to upcoming world events. Does this mean that prophecy is the most important characteristic of the true Church? No, love is (cf. 1 Corinthians 13:1,8). Yet, the pursuit of love is also tied in with prophecy in the Bible (1 Corinthians 14:1). Those who truly have the love of the truth, will be spared from some prophesied events according to 2 Thessalonians 2:9-12. Today, massive societal changes are taking place. Many of them are prophesied in the Bible. Even though between perhaps one-quarter to one-third of the entire Bible is prophetic, most simply do not understand that truth about various key prophecies in the Bible that Jesus urged His followers in the end to understand (e.g. Matthew 24:15). Various Jews knew that the Messiah was expected about the time that Jesus was on earth. Yet, the vast majority failed to properly recognize Him. Well, we are in the time that Jesus called the beginning of sorrows (Matthew 24:4-8). More sorrows and troubles are ahead, many world events are aligning with properly understood biblical prophecy, and true believers should be willing to watch and discern the signs of this time. 29 “Look at the fig tree, and all the trees. 30 When they are already budding, you see and know for yourselves that summer is now near. 31 So you also, when you see these things happening, know that the kingdom of God is near. 32 Assuredly, I say to you, this generation will by no means pass away till all things take place. 33 Heaven and earth will pass away, but My words will by no means pass away. Notice that Jesus taught that His followers will always to pay attention to events and prophecies related to His return. Jesus repeatedly told His followers to watch for world events that would fulfill prophecy in other scriptures such as Matthew 24:42, 25:13; Mark 13:9,33,34,35,37, and Revelation 3:3. Jesus did expect His followers to watch. Jesus used prophecy to keep His followers vigilant–He wanted them to be ‘hot’ and not lukewarm (Revelation 3:14-22). Having the Holy Spirit and properly being led by the Holy Spirit helps us understand prophecy. Yet many do not seem to believe that God’s Spirit is currently working prophetically now. Many also tend to despise biblical prophecies as well as, often, their proper explanation(s). Are we not a lot closer to the end now than when Paul wrote that? Paul also taught that true Christians were not to be like others who would not know near when Jesus would return (1 Thessalonians 5:4). Throughout the years, various ones have claimed that the end was sooner that it was. One of most famous in the 21st century were the pronouncements of the now deceased Harold Camping. But those who properly understood current events in the light on biblical prophecy could easily prove he was in error (for details, see Harold Camping’s Teachings About the End of the World Do Not Agree with the Bible). Part of that knowledge is prophetic. And part of that biblical knowledge tells us that the world will not end this year. This entry was posted on Sunday, September 27th, 2015 at 7:00 am	and is filed under COG News, Prophecy.